We met our baby girl 4 days after her due date, in the middle of the night, after an intense but brief labour. She was the tiniest, pinkest thing I had ever seen, screaming at the top of her lungs with a quivering jaw and floppy wet limbs. The rest of that night she slept on my belly, curled up like a snail, and I just lay there in the hospital room feeling exhausted but not sleeping and snapping horrible dark grainy iPhone pictures. 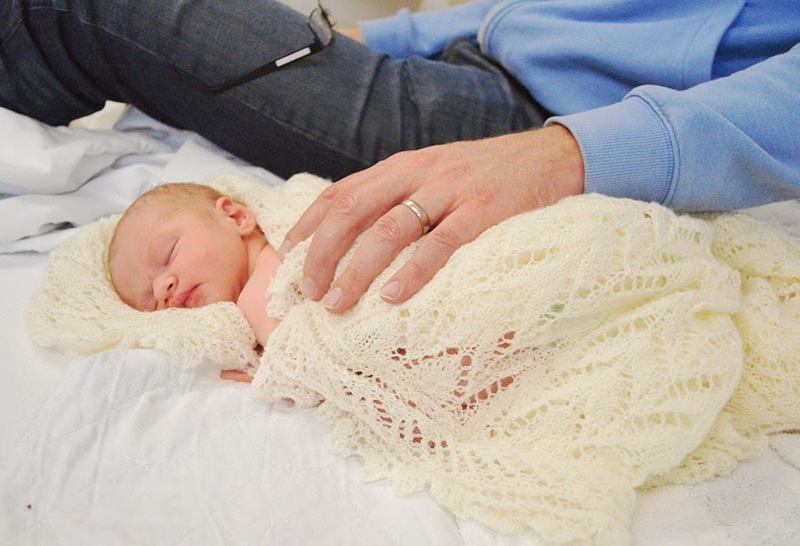 I didn't sleep that night, or the next, and eventually a hospital midwife came and took our sweet girl away from me for a few hours so I could rest. What a blessing - 3 hours sleep was Christmas. We stayed 3 nights in hospital on top of the night when she was born. I wanted to go home after 1 or 2 because those long nights alone in a hospital bed, trying to figure out what your baby needs from you, while your husband sleeps in your huge bed at home are kind of miserable in a precious sort of way. Actually, Ella was and is a pretty good sleeper, but I was so wired, with so many thoughts and feelings in my head that it was hard to sleep anyway. I ended up staying the full 4 days after some complications on the 3rd day. What can I say, I am still a bit traumatised by it -we must have pushed the emergency call button 3 times that day and I thank God that the right staff member/s happened to be on duty at the time. At one point I was lying on my back sucking on the gas and crying with several people poking and prodding me and that was definitely a low point. Everything from a migraine to the wrong meds to unspeakable gore happened that day; let's not get detailed. On day 4 we took our baby home. Until you have a baby yourself I don't think you can comprehend the significance of that short car journey with your precious cargo in the backseat. It was one of those perfectly beautiful days - the last day of autumn and the sun was so bright but the air was so cold. I haven't felt cold the entire time I was pregnant so I loved it. The whole way as we drove I kept thinking "the last time we made this trip I was in labour; Ella was in my belly; we hadn't met our girl; we had no idea what was coming." It was bizarrely special and overwhelming. We cranked up all the heaters in our house and my husband had gone to huge effort to make the house nice and welcoming for me and our baby, but in honesty I barely noticed. I was so tired and in such a daze that I could barely shift my focus away from the massive life change we were experiencing. That night Ella fell asleep on my legs and we spent the next hour or 2 trying to figure out what to dress her in for bed, and how to make her bed, arranging and rearranging the layers of blankets with no idea whether she should have a sheet or be wrapped or whether it was safe to put blankets on her or how many blankets she would need? And while it sounds trivial, there were crocodile tears shed over the stress of those small decisions. I was so tired I could barely think. I just wished one of the hospital midwives would show up and tell us what to do. On day 5 we were a little over ambitious and attempted to go out on a family picnic with our girl. We thought it would be fun to walk her around in her stroller and get some fresh air and take in some views. Har har. It took us hours to get ready to leave - finally we had packed a picnic and navigated our way through the baby carseat buckles and stroller assembly. When we got to our destination, we realised we had forgotten the bread (aka our meal), the wind was absolutely too freezing for our newborn, and I was in too much pain to walk anywhere. Rookies. That was a lot of writing about the days since her birth. It's better now. We are getting into a routine, and she is one of the sweetest most content babies I have met. I could gush for pages about how I love her and how she is showered in love from us and our families; how her funny faces make us laugh; how her little gasping cry breaks my brand-new-mummy heart; but you have probably heard those sort of cliches from other new parents and they will always just be cliches until you have your own and realise it's all true. Maybe I should talk about the labour. I'm leaving this until the end so if you are disturbed by the topic of birth-giving.... exit now. This is only my experience. If I have learnt anything about babies and pregnancy and labour, it's that there are not really any norms. My pregnancy was hellish, while others are sweet and smooth-sailing. My labour was brief, while others are.... not so. I was due to give birth on Saturday but apart from a few Braxton Hicks (fake, painless contractions that feel like a tightening across your abdomen) there was nothing happening. We kept ourselves busy that day and I think we went out for brunch in town. Weirdly, I know that we had a lot of quality time and lots of dates and outings before Ella was born (we purposely tried to make the most of every minute) but I actually don't remember what we did. Come Wednesday I was 3 days overdue but everything was as normal and I didn't feel any different. We decided to go and get a DVD out that night so we drove down to hire one. I was having those annoying Braxton Hicks again and didn't feel like hauling my heavy body from the car so Calum ducked into the store himself. Then I decided I really wanted some dark chocolate biscuits (unusual for me) and waited in the car again while Calum bought some TimTams. The Braxton Hicks were really uncomfortable and I kept shifting my weight and trying to loosen the seatbelt which was already loose. It wasn't exactly painful but, like I said, a tightening feeling around the belly. We got home and I voted to watch the movie in bed because lying down just seemed so much easier than sitting up. Calum kept saying "You might be going into labour!" and getting all excited and I would roll my eyes and be like "These are just Braxton Hicks. Trust me, it's nothing. If it was labour I would know about it. Now pass me those TimTams." After about 10 minutes of the movie I realised I had no idea what I was watching. I kept squirming and shuffling around trying to get comfortable and we started timing these fake contractions to find that they were in fact coming at steady 3 minute intervals and lasting about 5 seconds each. Calum texted the midwife to tell her I was having 5 second contractions (lol) and she replied that if it was truly the start of labour we were in for a long night. She told us to go to bed, take a paracetamol, and get in touch in the morning if it was still going. So we flicked out the lights and nestled down for a nice sleep. In our antenatal classes we were warned how long labour can take the first time. Like, brace yourself for 16 hours kind of thing. We were encouraged to stay at home as long as possible since you have so many hours to get through. We were told how labour would start SLOWly and there would be plenty of time to get prepared. Our tutor even mentioned we should still go to any appointments we had made or still go on a lunch date with our friends during that early stage of SLOW labour. We made birth plans and included things like: having a long bath; watching a movie to distract yourself; packing up last-minute things into your hospital bag; massage; etc. Within 5 minute of turning out the lights, I was just beginning to drift off, when I felt a sudden boot in my lower abdomen and HIT THE DECK. I mean actually rolled out of bed and dropped to the floor yelling and mashing my face into the mattress. It hit so fast that I didn't even know what was happening. Calum was startled out of his sleep and kept asking me "What's wrong? What's happening? How are you feeling? Are you ok?" and I was like STOP ASKING QUESTIONS AND USE YOUR INITIATIVE which is code for "I feel that I am in labour, kindly please call the midwife and request her assistance whilst running me a bath"
I got into the bath which I thought would be amazingly soothing on my cramping belly but actually it was just awkward - for some reason the pain that was hitting me every 3 minutes was the kind that requires you to physically brace yourself on something and instead I was flopping around like a beached whale with nothing to hold. After about 3 contractions I was like screw this get me out! And the husband near broke his back trying to haul this large mammal out of that tub. Calum had the bright idea of timing the contractions and while they were still coming every 3 minutes, they were lasting 45seconds to a minute each. We felt like we had literally just talked to the midwife and we felt bad annoying her again so late in the evening. But the timing of the contractions was concerning so Calum paged her and she agreed to come check me out, but told him not to get his hopes up because it was unlikely that I was very far progressed, it being so early. I don't think she really believed they were lasting a minute already, but she came round just to be nice. She was greeted with wailing and huffing breaths and loud yells and she probably thought "Geez this girl is being a tad dramatic isn't she. It's only been an hour!" At this point I had somehow ended up on a swiss ball rocking back and forth (so I did learn something from those antenatal class videos!) and hollering like nobody's business. Interestingly I am usually pretty quiet and I never would have pictured myself as a hollerer. But there I was, hollering my little lungs out. And spewing at the same time, also. The midwife looked at me and got me on the bed to do the exam, which is a nice term for what it is. After a minute she was like "Ok.... you are about to have a baby." And that is how we ended up not having time to drive to Wellington hospital, and not having time to remember to pack the things we were going to add, and most definitely not having time for a massage or a bath. Instead we ran (I hobbled in-between contractions) down the stairs and somehow we found ourselves racing to Kenepuru birthing units and next thing I knew I was whizzing across the carpark in a wheelchair and then, somehow, ended up in a delivery room on yet another swiss ball, stubbornly refusing to get off of it. My birth plan included a hot tub and a potential water birth. So someone dutifully filled this big blow-up jacuzzi in the bathroom while I suffered in silence (kidding) and they put me on the gas. I did not like the gas - it did nothing for the pain but instead it made my skin tingly and crawly all over and I felt awful but you can be certain I clutched that gas tube for dear life because it distracted me a fraction of a degree. And I remember my husband rubbing heat packs on my lower back but I had no idea until yesterday that he was running back and forth down the corridor for the entire labour to heat them in the microwave. I honestly thought he was there with me the whole time. And I remember him asking me if I wanted pain killers, and I remember thinking STOP ASKING QUESTIONS because I just wanted to focus, focus, get through the next contraction, breathe, get through the next, and so on. I think I had my eyes closed the entire time because for some reason contractions take a lot of concentration. And then the contractions got more intense and I was leaning back on the ball and my husband was trying for dear life to hold me up because I couldn't hold myself up and nope, I had no idea about this until a conversation last night when he told me. Now this whole time, I was waiting for the midwife, who knows all things, to tell me when I was 10cm dilated so that I could push. Because you can't push until 10cm. But she didn't tell me and suddenly I heard myself saying "The baby's coming" because I just knew that that "bearing-down" feeling could only mean one thing and I felt like my body was starting to push without my permission anyway. Nek minnut, I was up on the bed and I kept asking "Can I push yet?" And the midwife was like "If you need to push, honeybun, then push." So I did. And it hurt. And I screamed. Not hollered, screamed. After 3 pushes there was still no baby and being the stubborn woman that I am I made a pact with myself that on the next contraction I would get. this. baby. out. because I was sick of pushing and it hurt so much and I wanted it to be over and it felt like I would be pushing for the rest of my life. Long story (involving the emergency button being pressed) short, the baby was there about one second later and I was STUNNED to see a little person looking at me and screaming and suddenly being laid on my chest. And I was also stunned by the aftermath of birth - the fact that contractions continue after birth to get the placenta out; the absolute total mess that is everywhere especially all over me (literally covered in dried baby poop and blood. Somehow I just hadn't considered there would be mess like that. ); the fact that they put you back on the gas (not again!) in order to examine you; the pain that follows childbirth (when you assume it should all be over); and so on. So many things I could not be prepared for. It was not quite 1am and there we were with our girl, a complete mess, and totally elated. And the rest is already written at the top of this page. Welcome to the world little Ella! We could not be happier.